Little Darlings stamps is releasing a new collection today called Spring is in the Air. To introduce the four new darling stamps, the design team and a few guest designers are having a blog hop. 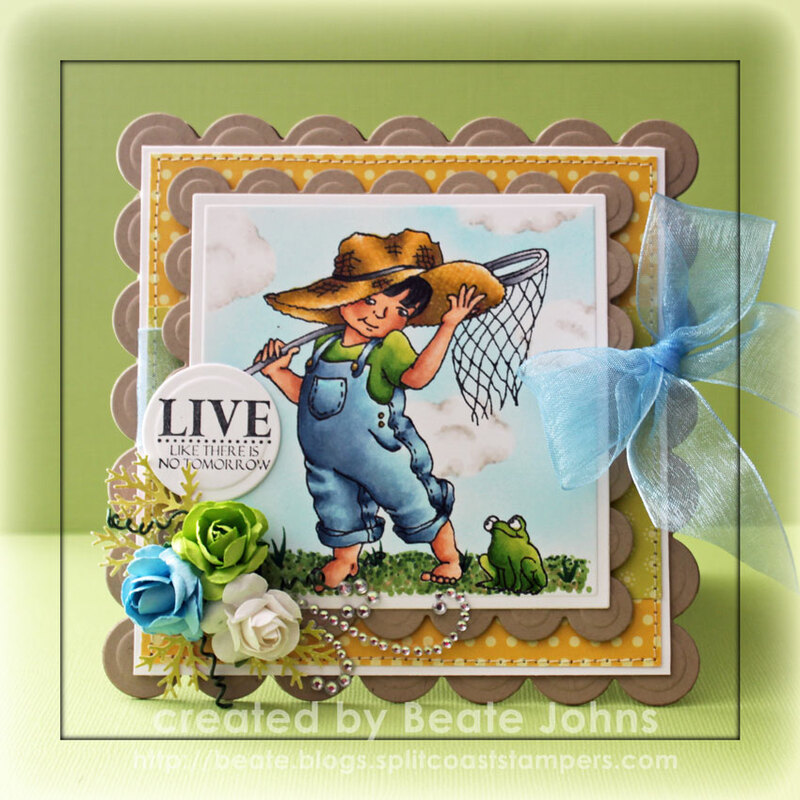 The hop coincides with the Little Darlings challenge and the theme Spring Colors. For my first sample I used the new image called Buddies. It was stamped in Tuxedo Black Memento Ink on a piece of white cardstock, cut and embossed with the largest Classic Square Nestabilities die. The image was colored with Copic Markers (Skin: E00, E11, E13 Hair: N5, N7, N9 Jeans: B0000, B91, B93, B95, B97 shirt/frog: YG21, YG23, YG17 Hat: Y23, Y26, Y28, E33 Net: C00, C1, C3, C5 Ground: G43, G46, E31). It was masked, cloud masks were added and the background was airbrushed with Copic Marker BG01. Shading was added to the clouds with Copic Markers W00, W0 and W1. The square was adhered to a piece of Kraft cardstock, cut and embossed with the largest Scallop Square Nestabilities die. A 2 3/4″ x 4 1/2″ strip of Pebbles Happy Go Lucky Patterned paper was adhered to a 4 1/2″ square of Pebbles May Bouquet Collection. The layers were stitched to a 3/16″ bigger piece of Solar White cardstock. Blue Organdy Ribbon was tied around the horizontal strip before the image was adhered over the center with dimensionals. The wires of three Zva Creative flowers were twisted together. The ends were rolled up with the help of my paper piercer. Branches punched out of Pebbles paper were added to the flower bouquet and it was adhered to the lower left corner of the image. Part of a Finesse Rhinestone Swirl was adhered next to the flowers. A sentiment from Whimsy’s Treasured Moments Tickets stamp set was stamped in Tuxedo Black Ink over a piece of cardstock that had been cut and embossed with a Standard Circle Nestabilities die. The sentiment was adhered above the flowers. The layers were adhered to the card base, Kraft cardstock cut and embossed with the second smallest Grand Scallop Square Nestabilities die. For my second card I used the image Isn’t She Lovely. The girl was stamped in Tuxedo Black Ink on Solar White cardstock and colored with Copic Markers (Skin: E50, E51, E53 Hair: Y26, E33, E35, E37 Dress: R30, R32, R35 Shoes and Trim: W00, W0, W1 Hat: YR20, YR21, YR23 Purse: YG11, YG13, YG17). 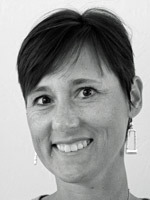 The image was cut out and set aside. The card base was cut out of Solar White cardstock with the Tim’s large tag die. A piece of the new Echo Park Graceful This & That paper was cut slightly smaller. The edges were sanded and another piece of the same paper pack was added as a horizontal strip. The edges were then stitched and seam binding was tied around the strip. A heart doily was adhered to the left hand side of the card. The image was adhered over the doily with dimensionals. A sentiment from Whimsy’s Friendship Ticket Sentiments was stamped over the oval that had been cut with the Large Tage and bookplates die. The oval was airbrushed with Copic Marker YR20, placed back into the bookplate frame and adhered partially under the girl frame. A butterfly from the same set was stamped on the same paper used for the card base and cut out. It was adhered to the lower right of the sentiment panel. To finish off the card a button was tied on over the bow with Linen thread. 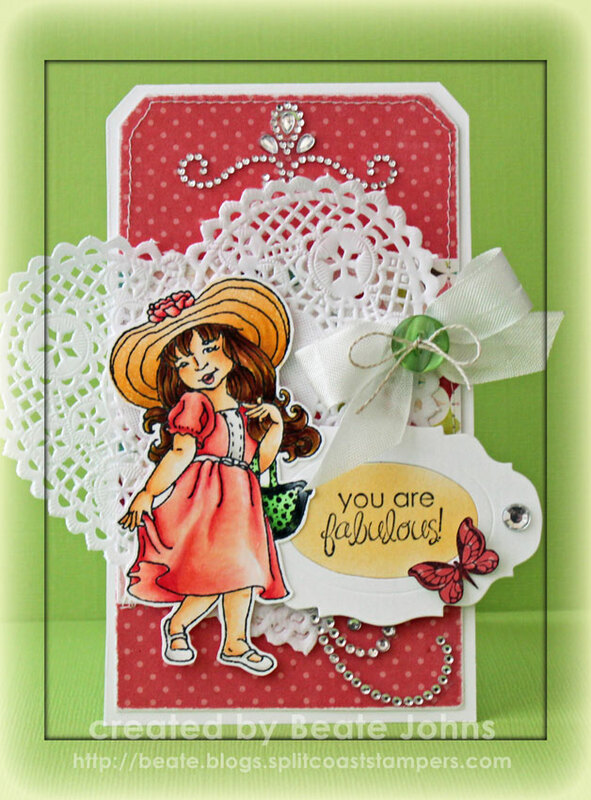 One of Nina’s gorgeous new Fancy That Want2Scrap Border bling was adhered to the top of the card. A Rhinestone was added the right hand side of the bookplate and part of a Finesse Rhinestone Swirl underneath it. Make sure you stop by the Challenge blog. One of the commenters there will receive blog candy! Do you like the images I used today? Leave me a comment and I will pick a winner on Thurday morning with the help of random.org. Thanks so much for stopping by! Have a wonderful day!